Early in the morning when I woke up seeing umpteen messages and flowers wishing “A very happy women’s day”; wondered why is that only this day becomes suddenly so special to a woman. Why to respect a woman; give her all the freedom she wants only on women’s day? Do we deserve only a day in our lives to be treated the way we want?? Where do men stand then in making a woman in their lives feel special about every day??? Okay so, I pushed my morning fast and reached my workplace, saw my colleague and yeah, for a ritual sake, wished her “Happy women’s day”. She smiled but did not mind to reply which made me to further question her. I was surprised by listening to her reply “I’m not a woman and neither are you”. It made me laugh, should I be called a woman only if I’m married or if I have a kid? What is to be a woman then? Since childhood we see our moms being supermoms. She wakes up early in the morning, preps breakfast, gets us ready for the school, makes herself ready for the day, cooks the lunch, doing all household chores, marching towards work, managing her first kid (her hub I mean, wink*) and us, our academics. And still not being tired her routine repeats. I never knew her secret unless I started seeing herself from her shoes, getting to know her responsibilities and the way she handles things so cool. We all have different views towards womanhood. Of course we have super fathers too; but women are proved to be multi- taskers’; A specially blessed being by the creator, heavens on earth. It’s just not about biological, it’s just not what is seen, but beyond that. Still these days, the impact on gender perceptions prevail, women face stereotypical statements from the most literate fellows too. Aah, it’s too technical for a woman to understand tax filing, you cannot drive, you are not supposed to express your views openly, you have to get permission to do social acts, you can shop only with husband’s or father’s credit card, you have to start thinking about settling crossing 25, you cannot prolong your work career after marriage, and most of all, you are a woman and you should sacrifice. Where did these norms come from? Why do we only have to be culturally bounded wherein men can drink and smoke and yet considered being cool? Do we come with a tag “limited”? Nope. Women can do far better jobs than men. Here, the talk is not being superior but being equal. I came across a quote which goes as “if you want something said, ask a man, if you want something done, ask a woman”. The statement is self explanatory! hands with my family, I’m buoyant, I carry my dignity and esteem, I take my strengths and weakness together, I show my aggression at times, I have my own mood swings, I like being odd, I do tattoos, I dislike pink too, I like being mechanical, I’m adventurous, I watch cricket and I know players beyond Sachin and Sehwag. I cry, laugh loud, whistle, shout and smile at a guy. I be silly and stupid yet be matured and YES, I’m a WOMAN, a SUPERWOMAN. I don’t have to show any typical notions to the world of me being a woman. I enjoy my womanhood, and I’m excited for upcoming years of womanhood. I have a respectable position in the society; do not fix a day to celebrate me. 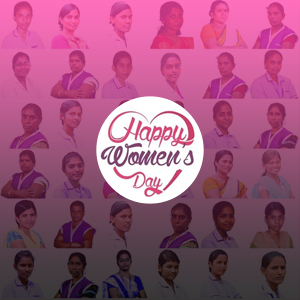 The respect shown to a woman everywhere around the world makes us celebrate women’s day every day. Recognize the special woman in your life.